IN CONTEXT is a new study format of PAS. For the second time PAS is invited by Enrico Centonze to the Grimmuseum in Berlin. In July 2010 we had a successful PAStudies with the topic EXTENSION as part of the performance art program at the Grimmuseum. The first IN CONTEXT edition will focus performance art in context of the museum. To live and to work in the Grimmuseum is one aspect of the studies. 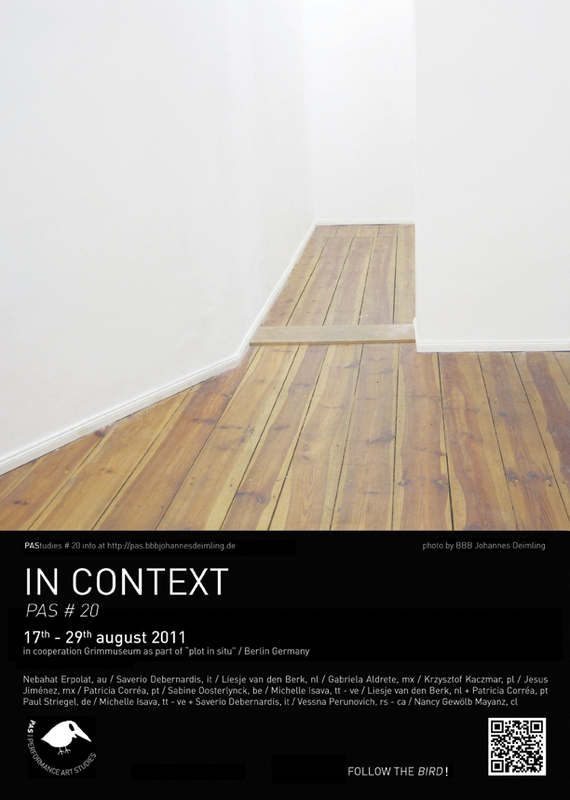 PAS IN CONTEXT will ask specific questions about the context of performance art in relation with the museum. Performance art is often recognized as an ephermal art form. How we are able to place our works into the context of a museum? Or how we can use the specific directions of a museum for the creation of our works? With this discourse we want to take part in the running discussions about documentation and preserving the relics of performance art pieces. The aim of this 12 days studies is to work out a performance and to present this as part of the final presentation in one museum in Berlin and as well in the Grimmuseum. Bereits zum zweiten Mal sind der Performer BBB Johannes Deimling und die Initiative „Performance Art Studies“ eine Kooperation mit dem Berliner Grimm Museum in der Fichte Str. eingegangen. Zwölf Künstler reisten zum Projekt „In Context“ an, um dort im Museum zu leben, zu arbeiten und am letzten August-Wochenende 2011 zu performen. Dabei galt es, „mit individuellen und interdisziplinären Ansätzen, neue Perspektiven und Fragen im Kontext zwischen Performance Art und Museum“ zu erkunden. Dies betrifft insbesondere die Situationsbezogenheit und Flüchtigkeit einer Performance, deren spezifische „auratische“ bzw. atmosphärische Eigentümlichkeit jedoch prinzipiell nicht museal konservierbar ist. Archiviert werden können nur requisitorische Relikte, Foto- oder Videoaufnahmen.